Zach Weiner, creator of the smart and hilarious webcomic Saturday Morning Breakfast Cereal, has written a children's book, and you can help bring it into the world. You can also fund a movie adaptation of one of the web's smartest comics, a fan film about Harry Potter's Mauraders, and more! Top image from Augie & The Green Knight, illustrated by Boulet. Snape, Lily, and The Marauders have graduated Hogwarts School of Witchcraft and Wizardry. At a local pub, James Potter and his friends reminisce about their last seven years, and contemplate their future. All seems bright for these four friends despite the darkness that awaits them, until Snape arrives. Thinking about the war they are to join and the part Snape might play, James decides to do something about Snape once and for all. For a $25 pledge, the team is offering backers a download of the finished film. Augie and the Green Knight is about 20,000 words long, and is a retelling of a famous medieval romance. The original story is about King Arthur's court encountering a strange giant Green Knight and the quest that follows. In this book, we get to hear the Green Knight's side of the story through the lens of a young nerdy girl named Augie. Augie is an expert in biology, math, and a bunch of other subjects that adults find boring. She goes off one morning for adventure, only to find herself in a strange world of fantasy. There, she has to use all of her intelligence to save a brave knight from death. 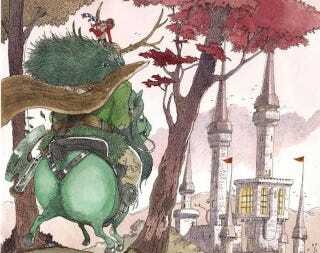 To make the project even better, Weiner got cartoonist Boulet to provide watercolor illustrations for his fantasy tale. That's an irresistible combination. For a $10 pledge, he's offering backers a digital copy of the book. For a $25 pledge, he's offering backers both the ebook and a physical copy. The Fifth Element is a movie with its own sense of style, but there are plenty of artists out there who enjoy putting their own spin on the world of Leeloo and Korben. This 156-page art book will collect the fan works of 76 different artists, creating a fresh universe of illustrations. For a $20 pledge, the team is offering backers a digital copy of the book, and they're offering both the physical book and the ebook for a $30 pledge. Jorge Cham's PhD Comics is another from our list of webcomics that will make you smarter, and in 2011, Cham turned his comic into a feature-length film. Now he wants to make a sequel, showing the funny side of grad school life. For a $15 pledge, Cham is offering backers both streaming access to and a download of the finished film.